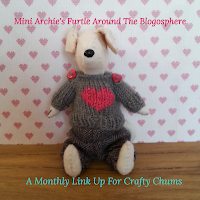 I thought I'd do a quick catch up post of things I haven't blogged about lately (or at all!) and so have made progress on since you last saw them - prepare yourself for lots (and lots!) of photos. And very few words. Well, that's the aim, at least!! *having reached the end of this post I can confirm that I completely failed at this! No surprise there! I'm not sure how obvious it is in this photo but I've just got one quadrant left to quilt (upper left) and then the lines in this direction are done. I've still got two other directions to do (see this photo) but I'm pleased with the progress I've made! 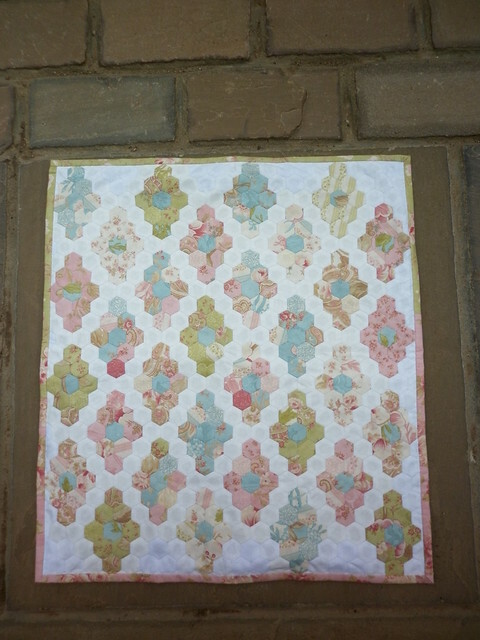 I pretended I was the always wonderful Lynne and quilted a grid. I marked the lines (3" apart) with a Hera marker and quilted them using Aurifil 2610 (medium grey) on the top and 5006 (aqua) in the bobbin - I've now marked (with a Sharpie) the point on the tension wheel where the tension is spot-on for quilting with Aurifil 50wt and Warm and White wadding as I think it's going to become my usual combination for machine quilting for the foreseeable future! The quilt top was hand pieced (using Inklingo, an easy and wonderful way of printing pieces directly onto the back of fabric, for the Drunkard's Path units and my usual freezer paper templates for the sashing and cornerstones) and I just need to decide whether to add piping before the binding. I know the binding is going to be yellow and any piping will probably also be yellow but I don't know whether or not to have a double layer at the edge or whether the binding will be enough to lift it. All opinions welcome! One set of points is now joined together and I have the other three big triangles cut, just waiting for me to get back to them. My friend, B, and I discovered (invented?!!) a really good way of cutting large QST triangles - I'll make a tutorial when I get a moment, if anyone is interested? My aim is to be hand quilting this quilt by the time the Christmas films are on the telly - I want to be watching 'Miracle on 34th Street' and quilting this quilt, probably while also drinking a cup of tea and enjoying some chocolate!! I've got a way to go yet as I'm adding rows top and bottom to make it an oblong quilt but I'm hoping that once the giant star is made I can get cracking with the rest of it...I just need to decide exactly what the rest of it will be! I was in my LYS when I spotted some gorgeous crochet cotton (Katia Jaipur) and had to have a couple of balls. Then I saw this pattern on Ravelry and knew I'd found the perfect project for my yarn! I've come to a bit of a standstill with this as I need to join in the second ball but I know how I'm going to do it now, I just need to get round to it! 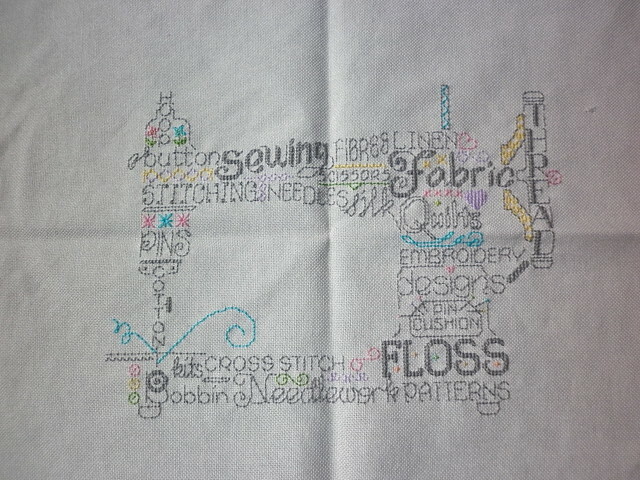 I just need to turn it into a cushion, once I've decided on the fabric for a border (or two). Edited to add: I've had a few enquiries about the pattern for this so have added a photo of the front of the pattern to my Flickr stream here. Hope that helps you track it down! and I'm pleased that I've made progress on two of them since I took the photos for the list - I'm aiming to have the DP quilt and sewing machine cushion finished by the end of the quarter and to have made significant progress on the others. Don't hold your breath, though!! They have a Hallowe'en feel about them now - not what I was intending!! 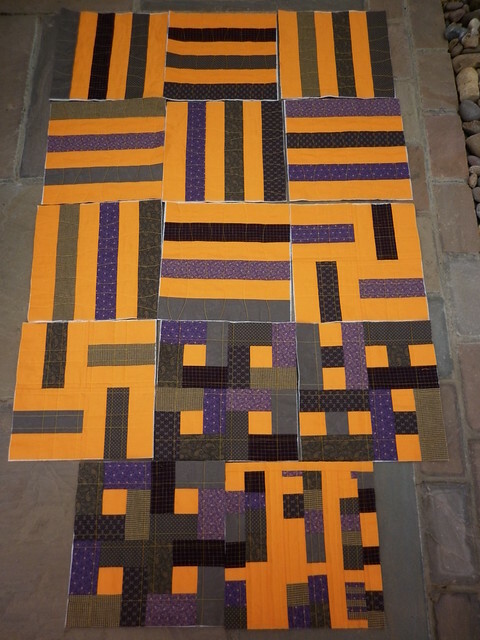 I used a fat eighth bundle and 75cm of orange to brighten it up (no idea of the shade but it's a Bella solid) and managed to make thirteen blocks with no waste from the bundle (other than what I trimmed off to square up the fabric) and very few leftovers of the orange (those that were left could be easily scrunched in my fist!). I decided that the best way to go would be to cut all the fabric into 2.5" strips (which made the best use of the fat eighths) and make several blocks of the same/similar design. That way I made maximum use of the fabric and the energy I had available. A lovely friend bought the wadding (thanks, P!) and they were quilted using a variegated yellow ('sunrise') YLI machine quilting thread (40wt) on the top and an orange (1154) Aurifil 12wt in the bobbin - I needed to fiddle a little bit with the top tension to get the stitches nesting in the middle (or somewhere close to the middle!) of the wadding but these two different weights of thread played nicely together. As you can see, one block is made from all the bits I had left after I'd made the other twelve blocks - it looks better than I thought it would! Alison will be collecting blocks for quite a while yet so please consider making some for her - it's for a wonderful cause. Visit her blog for more details. Thank you, Yvonne, I love it! I didn't expect to see these hexies again but it's lovely to have them back and now when I look at them I'm sure I hear a faint Mutley chuckle - all that plotting must have been passed on to them!! You honestly think I should be okay with this? Well, I've got news for you. I'm not. 'Unimpressed' doesn't really cover it!! In fact, sometimes it's so tough that you need to kip partway through a job! It's mine, all mine!! Oh, don't I look handsome today? Very distinguished! That's me done (at long last) and I'm now thoroughly caught up with myself - that feels better! 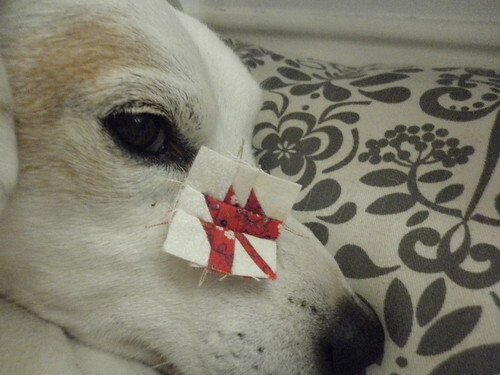 Well done if you got this far (even if you just flicked through and glanced at the photos! ), I hope to be back before this time next month but I'm making no promises!! Wow thqt's lots done! Makes me think a I must get going on my list. That hexie quilt is so so so stunning! I frickin love your hexie quilt and I'm a bit smitten with you sewing machine embroidery too! Share the pattern details? Archie obviously just needed a little nap after the challenges of entertaining and having to share his spot! Great projects! Lots to look at and explore some more. Thanks for sharing. You have some beautiful projects there. The hand quilting is coming along great! What a lovely catch up. Impressive lot of work! All interesting projects. 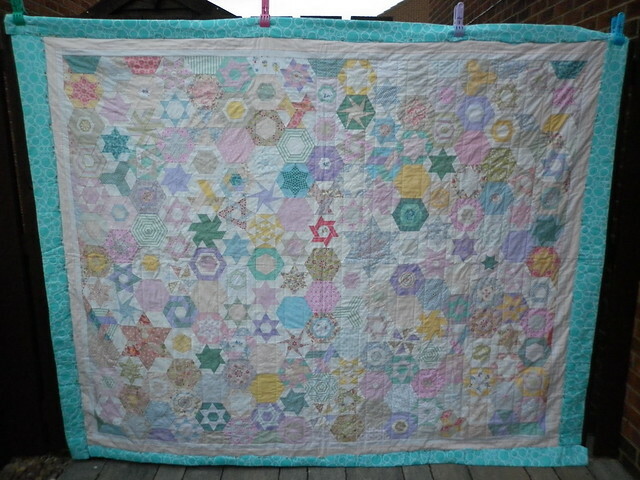 Would love to see a close up of your hand quilting on the hey quilt, it is beautiful! Wow, your projects are all so beautiful. 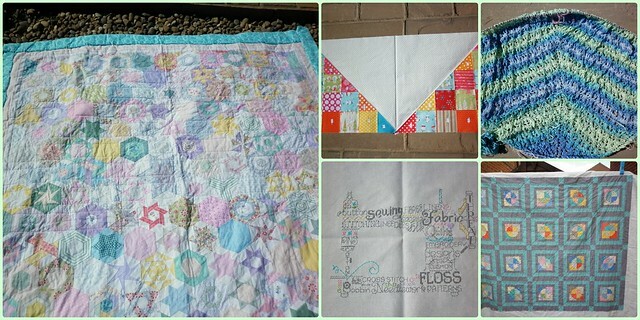 I especially love that hexie quilt, it is going to be finished soon too. Fabulous projects Helen. I'm going to investigate inklingo, I love hand piecing but hate transferring the templates onto fabric, so it sounds perfect for me! A lot of progress there! I too am smitten by your sewing machine embroidery, is it from a pattern? 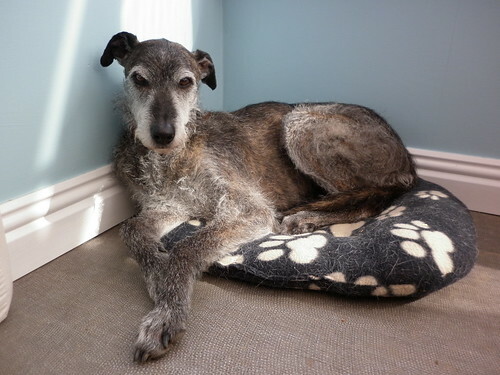 No wonder you are sleeping, Archie.....you have been a busy Beaver all month, making beautiful quilty perfection. Lovely to see everything that you've been working on! Thanks for sharing! Lovely things, you've been busy! For some reason I Always am very pleased when you visit my blog. (can't explain why) and I am also very fond of yours. You are going as fast as the train I am on, these days. I cannot begin to comprehend the time you must have spent making all these lovely things. The pictures are gorgeous, espececially the one of your handsome visitor. How does Archie react when his favourite cushion is taken? Gorgeous work! 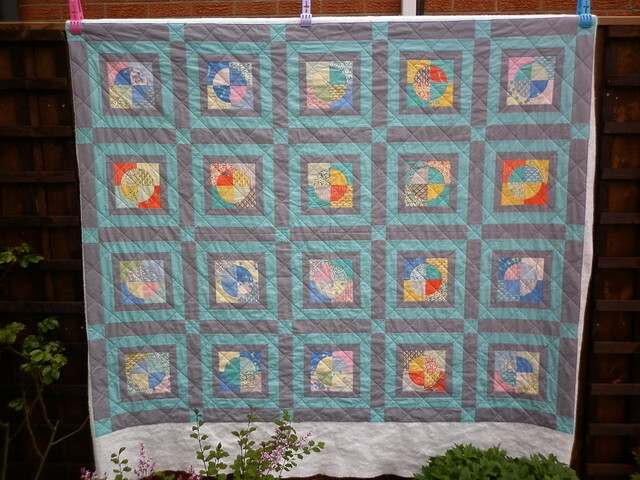 The hexie quilt is looking amazing and I love your finished machine. 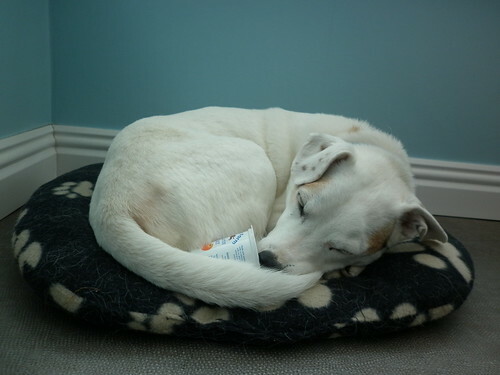 Check out Archie with the yoghurt! I've still yet to try that flavour! Oh, my! You get so much done! 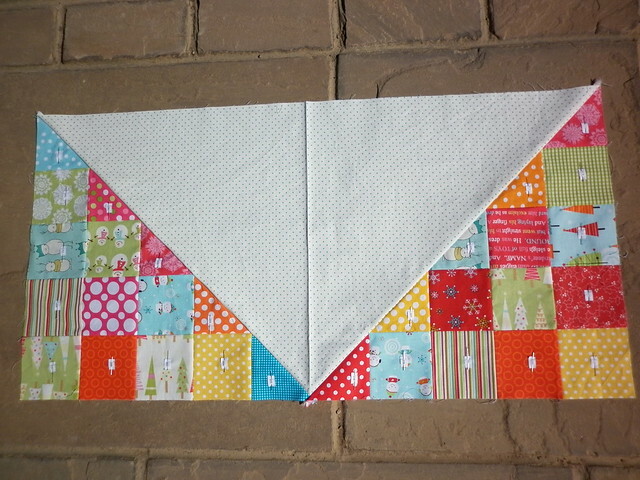 Love your hexie quilt and, of course, I adore the Drunkard's Path quilt as that's one of my favourite blocks. And the sewing machine embroidery is wonderful - where did you get the pattern? I love it! Pats to Archie and friend. I always enjoy your work, and posts tremendously! The projects are all so beautiful! 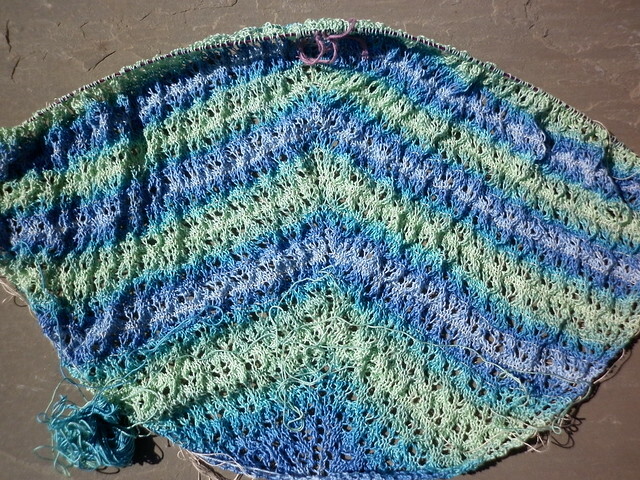 The shawl is going to loook lovely. Such cute pics of the dogs! Wow! What fabulous makes! 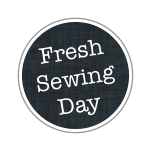 Love, love, love that sewing machine embroidery - did you design it yourself? I cannot believe how much you have got done, and I will get to see it all in a few days. Woohoo!!! Glad to see you've been getting in a goid amount of sewing and knitting. You won the giveaway at "verry kerry berry"